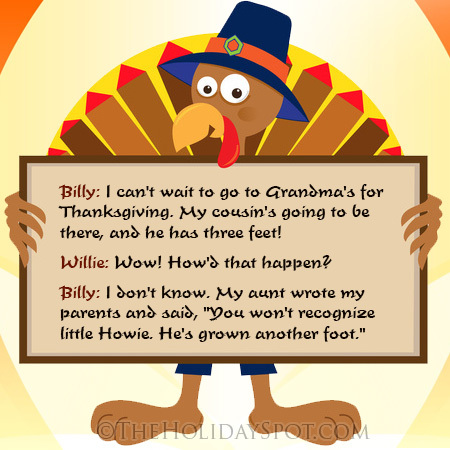 Q: Why was the monster tickled when he ate the turkey? A: Because he forgot to pluck the feathers! Q: What's the best thing to put into a pumpkin pie? When did people think Fall began in the past? Autumn is a season for big decisions -- like whether or not it's too late to start spring cleaning. Autumn -- time to drag out your winter clothes and see what kind of summer fun the moths had. This is an exciting autumn. Our athletes are breaking the records for the most Olympic medals, and our political candidates are breaking the records for the most campaign promises. Now, today’s lawn & garden tip. If you haven’t found the hedge trimmer yet, forget it. It’s almost time now to lose the leaf rake. I could tell there was a hint of autumn in the air when my son's football smashed me in the face. It's fall, that time when the colors change form green to red to gold -- and that's just the gunk in your swimming pool. Autumn is a great time of the year. Soon those ugly patches of dead grass in your lawn will be covered up -- with ugly patches of dead leaves. A store manager in Texas overheard a clerk saying to a customer, "No, ma'am, we haven't had any for some weeks now, and it doesn't look as if we'll be getting any soon." Two men were out hunting. They decided to separate to get a better chance of catching something. The first hunter tells the other, "If you get lost, fire three shots into the air every hour. That way I can pinpoint you and find you." After about three hours, the second hunter finds he is really lost. He decides to fire three shots into the air as the first man told him. He then waits an hour and does it again. He repeats this until he is out of ammo. The next morning, the first hunter finds the second with the help of forest rangers. He asks his friend if he did as instructed. The hunter answers, "Yes, I fired three shots into the air every hour on the hour until I ran out of arrows." Q: What kind of vegetable would you like tonight? Last year on Thanksgiving, the childless farmer and his wife prayed for all their blessings. But, they also prayed that their loneliness of having no children be relieved. Their prayers were answered and the wife became pregnant. She gave birth to triplets! A friend remarked, "See, prayers are always answered." The farmer then then replied, "Yes, but I never prayed for a bumper crop like this!" At Thanksgiving with her folks, single Sally prayed the following, "Oh Dear Lord, I'm thankful for all the blessing in my life. And, I'm not asking for this for myself. But please send my mother a son-in-law." In many cases, Thanksgiving would be much more heartily enjoyed if it came BEFORE election day! -- William S. Burroughs, "A Thanksgiving Prayer". Q: Rich people eat what on thanksgiving? Q: On which holiday do you pay a lot of jokes on thanksgiving? Q: What do policemen eat on thanksgiving? A: Corn on the cap. Q: What is Thanksgiving for selfish people called?